I’m always a little apprehensive when i get to the finale of a dystopian trilogy, but this one really delivered. We get the exciting conclusion of Ember and Chase’s story – as they try to find freedom and keep those they love safe. We meet up with Ember and Chase as they are trying to find the Safe House which they learn has been blown up. They are searching for other survivors – following the direction that they’ve been given to get to other outposts in the hopes that they’ll find help and supplies. Rebecca and Sean are still with them, Rebecca still being quite injured and slowing them down a bit, but Ember’s guilt of being the cause of her injury still weighs heavy so she fights to keep Rebecca with them. This group has split from another part of the group which includes Tucker – and we’re still on the fence about being able to trust him. In this book ,Ember still believes that he’s one of the good guys now, even though he killed her mother and hasn’t been on their side the whole story. She just needs to hold onto the hope that there are more survivors, and holds onto his voice that’s on the other end of the radio. As they travel, Chase and Ember’s group come across what they call the Lost Boys – a group of wild boys that try to capture Ember, and someone comes to their rescue – that turns out to be Jesse – Chase’s uncle. they link up with Jesse who seems to have an uncanny knowledge for all things leading to safety and that makes Ember wonder why he knows so much and what that means. Ultimately though, Jesse leads them to Endurance, a camp that is set up by a well established group – and the question becomes, is Three there? What power does Three have, and will anyone be able to help keep Ember and Chase safe given that they are being acused of so much and are being hunted since a picture has surfaced of them from the hospital in Chicago. This story takes us on a roller coaster of emotions and fear. They are running constantly, from the MM, from other soldiers, and trying to find those that they can trust in order to hide them and keep them safe. They get injured to the point of being on the brink of death, some don’t even make it. What’s really nice about this finale is that it’s realistic. You get the nice twist at the end about where the story stems from and where it’s going. You see that there’s more to some of the folks that seem quite hard, and you want to hope for the best, knowing that it’s war and that won’t happen. We see Ember come into her own, at the beginning of the series she was just another teenager, trying to get by – missing her love (Chase) because he had been taken away by her uncle and then joined the army. Because of the circumstances of her life, she’s forced to become someone strong, someone who can lead and someone who fights not only for her survival but for the hope of others. All the while we get a really sweet love story – not just between Chase and Ember but with Sean and Rebecca. It shows us that there’s still something good that comes out of War and that there should be something to hold onto even when things look bleak. The epilogue was exactly what i needed for closure of this story. so often i feel let down by authors of dystopia – they seem to feel like keeping things a little open ended is what readers want, but i have to say, being finite about an ending – that’s something that i can appreciate, even if it’s not where i thought the story was going to take us. Suffice it to say, there are a lot of tears at the end of this story – so i hope that you are prepared when you come to the close of this series. Enjoy! 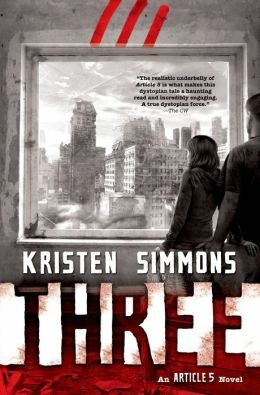 This entry was posted in Dystopian, Reviews, Young Adult and tagged Article 5, Dystopian, Kristen Simmons, Three, YA by iscm13. Bookmark the permalink.